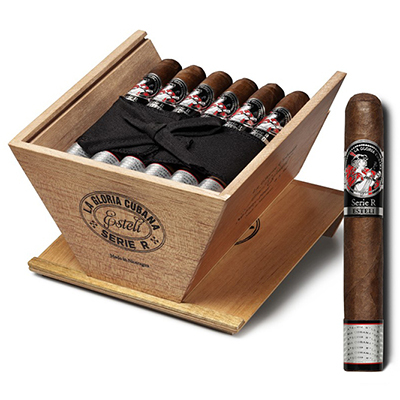 La Gloria Cubana Serie R Estelí cigars owe their exquisite, bold taste to an oily Jalapa Sol wrapper and a perfectly balanced combination of well-aged Nicaraguan viso and ligero tobaccos. Carrying on the tradition of the top selling Serie R line, the Serie R Estelí is a refined and full-flavored smoke. Beautifully constructed with an excellent draw and burn, these medium- to full-bodied cigars are smooth, earthy and sweet with touches of spice. Named after Estelí, the Nicaraguan town in which they are produced, the Serie R Estelí hand-rolled cigars are an exceptional addition to the La Gloria Cubana stable of premium cigars.